In this book, Julie Bogart distills decades of experience--homeschooling her five now grown children, developing curricula, and training homeschooling families around the world--to show parents how to make education an exciting, even enchanting, experience for their kids, whether they're in elementary or high school. Enchantment is about ease, not striving. Bogart shows parents how to make room for surprise, mystery, risk, and adventure in their family's routine, so they can create an environment that naturally moves learning forward. If a child wants to pick up a new hobby or explore a subject area that the parent knows little about, it's easy to simply say "no" to end the discussion and the parental discomfort, while dousing their child's curious spark. 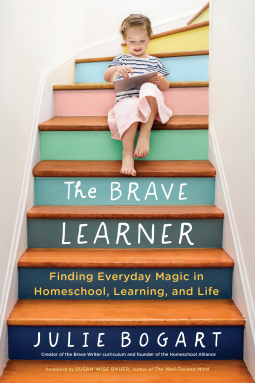 Bogart gently invites parents to model brave learning for their kids so they, too, can approach life with curiosity, joy, and the courage to take learning risks.